Of all places– in the town where one of the worst Civil War battles was fought– in Gettysburg, Pennsylvania– a home owners association told a family they can’t have holiday lights for Christmas or a sign that says, “Jesus” on their front yard. The homeowners association actually told the family to remove the sign because someone was “offended” by it. At Christmas. Jesus. The reason for celebrating Christmas. The area where thousands spilt their blood for civil rights and for the rights protected by the U.S. Constitution, is now inhabited by people who do not have a clue about the namesake of their historic town. It was the Gettysburg Address through which President Lincoln proclaimed freedom. And yet the residents of Gettysburg won’t let their neighbors put a sign in their yard on their own property? Is everyone losing it this Christmas? Mark and Lynn Wivell of Adams County, a Gettysburg subdivision, said they put up their Jesus display last Saturday, FOX43 reported. “As part of our Christmas decoration, we would display the name Jesus to point out to everyone that we in this family believe that the reason for the season is to celebrate the birth of Jesus,” said Mark Wivell told FOX43. 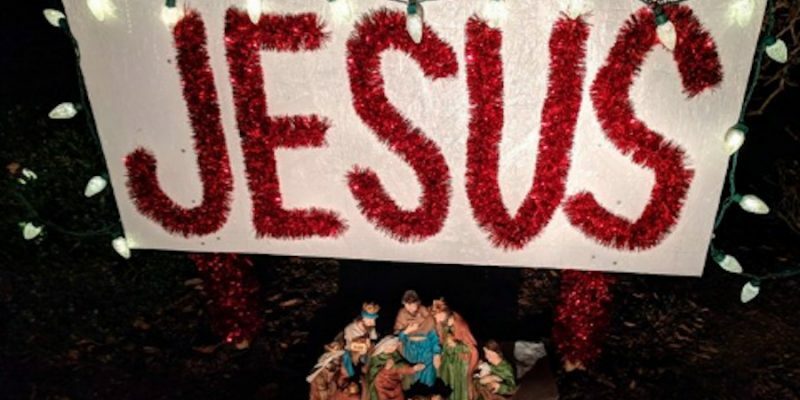 USA Today reported that the Wivells “violated the rules” because the display “was a sign, not a decoration.” But how else does someone else state Merry Christmas or Happy Birthday Jesus without writing the words? How is a sign not a decoration? The communist mindset was in full force in the justification of the homeowners association president, Bud Vance, who wrote to the Gettysburg Times that, “After taking a look at it, it isn’t in accordance with normal Christmas decorations.” A nativity isn’t a “normal” Christmas decoration? Is this for real? People can’t decorate their own lawns however they want? What if a ghost was offensive to someone? What if Halloween skeletons were offensive? What about fake gravestones? Perhaps no one should be able to celebrate the pagan holiday of Halloween because it is too scary? It’s hard to believe that this kind of logic exists in America, let alone in one of the most historic places in America, Gettysburg. One does not know whether to laugh or to cry. Next Christmas, perhaps someone will claim that depictions of Jesus are racist, sexist, or homophobic. Previous Article Is Princess Michael’s ‘Blackamoor’ Brooch Really Racist?